What a beautiful and unique way to thank your girls for being your Bridesmaids! 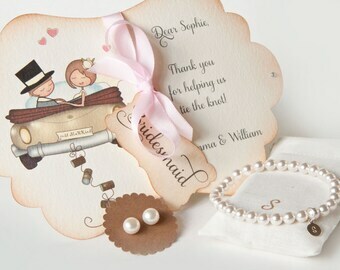 A personalized boxes card WITH a pair of genuine 7mm pearl stud earrings. This is a listing for a beautiful personalized boxed card and earrings for a Bridesmaid, but can also be made for a Maid of Honor, Matron of Honor or Flower Girl. My freshwater pearls are known for their incredible lustre and thick nacre. These pearls are a unique and AA quality pearl. The pearls on the studs are flat on the back. Please keep in mind that these are REAL pearls and therefor not 100% identical. 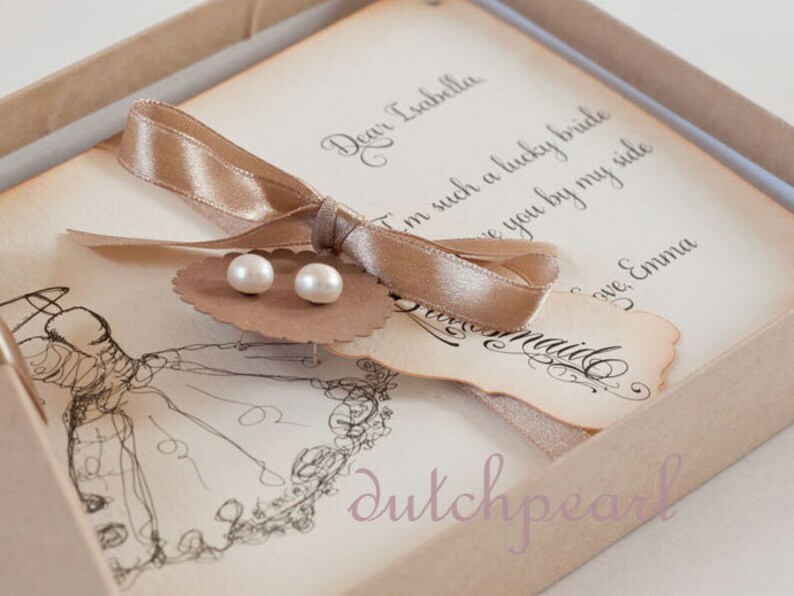 The genuine pearl studs come with a beautiful handmade personalized card in box. The dress has glitter on the bottom and waist, and the card is embellished with rhinestones in the four corners. Around the card is a satin ribbon in the color of your choice, with a beautiful calligraphy wording of Bridesmaid, but can also be made for a Maid of Honor, Matron of Honor, Flower Girl, Mother of Bride or Mother of Groom. This little card has also been made with vintage edges by hand with sepia ink. The text can be personalized with the Bridesmaid's name and your own name.